ESA’s next generation Sun explorer, Solar Orbiter will be launched in 2017. It will investigate the connections and the coupling between the Sun and the heliosphere, a huge bubble in space created by the solar wind. The solar wind can cause auroras and disrupt satellite-based communication. A European spacecraft set to launch toward the sun in 2017 will be protected by a paint once used in prehistoric cave art. The European Space Agency's Solar Orbiter probe will be coated in a substance derived from burnt bone charcoal — a type of pigment once used by early humans to create art on the insides of caves in France. The robust substance traditionally made from burned bones should help protect the Solar Orbiter when it flies as closer to the sun than any spacecraft before it. 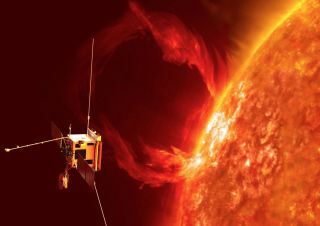 While observing the sun from space, the Solar Orbiter will have to face temperatures up to 968 degrees Fahrenheit (520 degrees Celsius), ESA officials said. Scientists working with the spacecraft realized that they needed to re-work the heat shield when they ruled out their initial choice to use a carbon fiber fabric in 2010, they added. 'We soon identified a problem with the heat shield requirements," Andrew Norman, a materials technology specialist, said in an ESA statement. "To go on absorbing sunlight, then convert it into infrared to radiate back out to space, its surface material needs to maintain constant 'thermo-optical properties' — keep the same color despite years of exposure to extreme ultraviolet radiation. "At the same time, the shield cannot shed material or outgas vapor, because of the risk of contaminating Solar Orbiter’s highly sensitive instruments," Norman added. "And it has to avoid any build-up of static charge in the solar wind because that might threaten a disruptive or even destructive discharge." "The big advantage is that the new layer ends up bonded, rather than only painted or stuck on," John O'Donoghue, Managing Director of Enbio, said of the Solar Black material in a statement. "It effectively becomes part of the metal — when you handle metal you never worry about its surface coming off in your hands." ESA engineers are planning to test Solar Black-treated titanium to see how it will hold up in a vacuum chamber that will simulate some of the environments the spacecraft could encounter while observing the sun.